Donna is a super host! She brought me chilled beverages, was patient when I wanted TV late at night, and made me a killer breakfast extra-early to I could catch my flight. The place is SPARKLING clean - bed big and comfy. Terrific stay! The owner was accommodating to all of our needs. It was a perfect location to unwind after being on a sailboat for several weeks. I recommend any one visit Antigua to stay in this nice place. It is located close to city and other important destinations. Price is reasonable and room service is good. Just sit out side on the nice porch and relax if you have free time. I love everything about my stay friendly staff got the opportunity to meet miss Donna she was so friendly. Dis will be my go to place now when I'm in Antigua........ location was great place clean and nice...... love it. Quiet location, very comfortable bed, kitchen furnished with all necessary conveniences, AC worked like a charm, TV provided a variety of channels, and hostess was very accommodating and welcoming! Overall great experience, amazing staff. I was here on business. Thx staff and management were very polite and helpful ! I go to Antigua quite often on business and definitely found my home away from home! Staff was very friendly, that would be the reason why I would return. The room was spacious and had all the ammenties as mention online. The room is very comfortable, nice location and very peaceful. Lock in a great price for Antigua Seaview – rated 9 by recent guests! 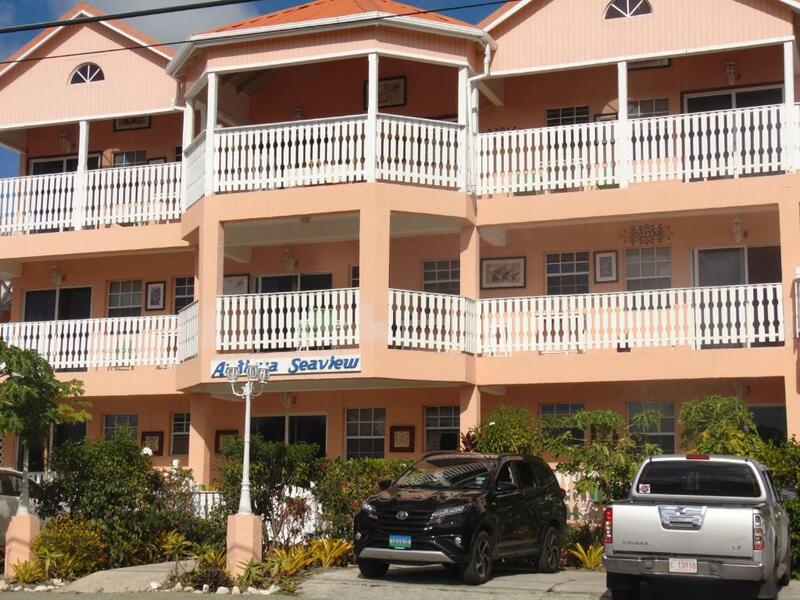 Antigua Seaview is located 1.9 mi from Saint John’s capital city and about 7 minutes’ drive from Antigua and Barbuda Museum. Free WiFi access is available in all rooms. The apartment will provide you with air conditioning, a balcony and a terrace. There is a full kitchen with a microwave and an oven. The bathrooms come with a bath or shower and a hairdryer. You can enjoy mountain view and garden view from the room. At Antigua Seaview you will find a terrace. The property offers free parking. VC Bird International Airport is located 8.7 mi from the property. When would you like to stay at Antigua Seaview? This suite has a sofa, microwave and air conditioning. This suite offers a panoramic view of the lush green hills called "The Sleeping Indian", St. John's City and the turquoise ocean on the west coast. This suite features kitchen, fridge, stove, king or queen beds, queen sized sofa-bed and spacious balcony for dining. This air-conditioned fully furnished unit has a sofa bed, double or queen beds and kitchen with stove, fridge and appliances. This studio apartment has a large kitchen, a spacious patio views of the ocean. 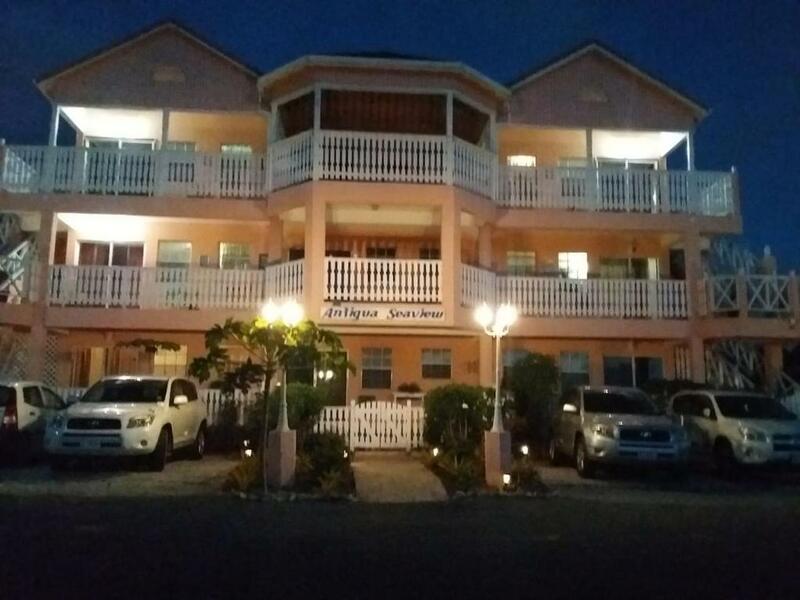 Hi Valued Guests, It's my pleasure to introduce you to our accommodations in our warm and friendly island. I'm Donna, excited and joyful to share our Antiguan hospitality with you. Eat tropical fruits, bask in our golden sand and swim daily. House Rules Antigua Seaview takes special requests – add in the next step! Antigua Seaview accepts these cards and reserves the right to temporarily hold an amount prior to arrival. A deposit of one night is required for bookings less than one week. Deposit of three night if booking is more than one week. Please inform Antigua Seaview of your expected arrival time in advance. You can use the Special Requests box when booking, or contact the property directly using the contact details in your confirmation. Love the breakfast, the room was also great. Not what was advertised. Small room very little utensils in kitchen. Furniture in need of upgrade. Bed small and uncomfortable. I would not stay there again nor recommend to others. Accommodation equivalent to 2 star maximum. Not worth the money and I am a seasoned traveller to the Caribbean. It was clean. Staff friendly and helpful. Arrival instructions could've been more clear - I think Donna is tweaking this so that future guests' check in a more seamless. Donna, the owner, was great. Very friendly and made us feel right at home. She went above and beyond, always asking if we needed anything and brought us fresh fruit from her garden. Jacuzzi tub was not working. No complaints what so ever. The water pressure was low at times. The friendliness of the host. The place is in a very quite area and has a beautiful view as well as everything you would need is just a few minutes away. Host ensured that we were comfortable throughout our stay. As we were on a business trip we needed to have some sort of transportation available. This was done for us. The hostess, Donna's meticulous attention to detail, her care and concern to "make it right".